On Day 4, Matt Salsberg announced to the table that, "Queens have been good to me." Little did he know that one day later he would reach the apex of his poker career and win a World Poker Tour title holding, you guessed it, two queens. During the first level of play, Theo Jorgensen won a massive hand against Timothy Adams to take the chip lead. After a series of preflop raises, Jorgensen was all in and at risk holding , and Adams was crushed with . The board ran out , and Jorgensen doubled to over 2.6 million chips. A few hands later, Fabian Quoss was the first player eliminated. Quoss open-shoved with and was snapped off by Philipp Gruissem with . The flop, turn, and river were dealt , and Quoss hit the rail in sixth place, earning €75,765. In the next couple of orbits, Mohsin Charania began chipping up. Charania picked off a bluff from Jorgensen with ace-high, winning him a 300,000-chip pot, and then he took down a three-bet pot against Gruissem without a showdown. Meanwhile Jorgensen was bleeding chips, going from chip leader to second-to-last in the counts, but then he doubled again – this time through Charania. Charania opened the pot from under the gun with , Jorgensen three-bet to 150,000 with , and Charania put in a fourth bet. Jorgensen moved all in, Charania snapped it off, and we were off to the races. It was practically over when the flop fell , giving Jorgensen a full house, and the turn and river bricked , respectively. Charania got the rest of his stack in the middle a few hands later when he open-shoved with . Unfortunately for him Salsberg made the call with , and held as the board ran out . Charania was out in fifth place, earning €95,615 for his efforts. Adams was the next player to bow out of the competition. After taking down a few small pots, he three-bet jammed for 751,000 with over an open from Gruissem. Gruissem called with , and held as the board came . Adams was out in fourth place, pocketing €125,775 for his efforts. Three-handed play began in the middle of Level 26, and lasted for a little over three hours. Thanks to a good run of cards, and a bit of well-timed aggression, Jorgensen jumped out to a big lead. The Dane made queens full of nines and then fours full of queens during the beginning of three-handed play, and crossed the three million-chip mark. He didn’t keep the lead for long however – Salsberg won a monster pot off of Jorgensen with just a pair of nines. Salsberg opened to 140,000 on the button with , Jorgensen three-bet with , and Salsberg made the call. The flop fell , Jorgensen led out for 300,000, and Salsberg quickly called. The turn was the , Jorgensen led again – this time for 750,000 – and Salsberg tank-called. Both players checked after the completed the board, and Salsberg took down the pot, retaking the chip lead. Gruissem was slipping, but he doubled twice through Jorgensen. In the first hand, Gruissem open-jamed with and Jorgensen called with . The board came , and Gruissem held. A few hands later, Gruissem open-jammed with from the small blind and Jorgensen made a nice call with from the big. Gruissem won when the board ran out , and it looked like the German was back in contention. Jorgensen cut Gruissem’s comeback short in Level 28 however. Gruissem three-bet shoved over a button open from Jorgensen, and Jorgensen called with . Jorgensen was well ahead with , but the flop gave Jorgensen a leading pair of kings. 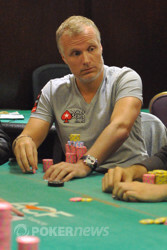 The turn and river came , respectively, and Gruissem was eliminated in third place (€170,065). Jorgensen began heads-up play with a slight lead, and he began to pull away quickly. On the first hand, Jorgensen out-kicked Salsberg in a three-bet pot, and a few hands later he extracted three streets of value from Salsberg, extending his lead to a near 2:1 chip advantage. After a little bit of back-and-forth, Jorgensen extended his lead even more, check-jamming with a lone pair of sevens on a board. Salsberg had air, and was forced to fold. At this point, Jorgensen had a near 4:1 chip advantage, but it wasn’t for long. At the very end of Level 30, Jorgensen open-jammed holding and Salsberg called with . It looked like the pot would be chopped, but the flop gave Salsberg a leading pair of fours, and the board completed , , doubling Salsberg. The Hollywood producer then took the chip lead during Level 31. He three-bet jammed with and Jorgensen quickly called with . The flop gave Salsberg a flush draw, the on the turn was no help, and the spiked on the river, giving the chip lead. Jorgensen was visibly frustrated and on the last hand he limp-jammed holding . Salsberg called immediately with , and it was all over as the board ran out . Jorgensen, who was trying to become the first player to win the same WPT event twice, fell just short, but still earned an impressive €264,600 for his efforts. 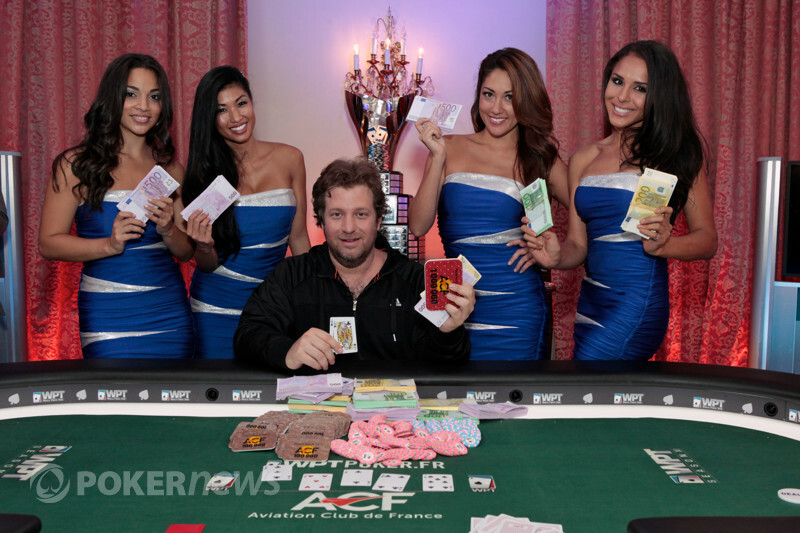 For Salsberg, this is the greatest moment of his poker career. 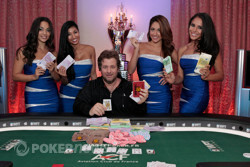 Coming into the WPT Season XI Grand Prix de Paris, his largest score was for just over $100,000. Now, he has a massive €400,000 score, a WPT title to his name, and a ticket into the $25,000 WPT World Championship in May of 2013. Thank you for joining us during this journey in Paris, France. That last five days have been filled with breath-taking poker here at the Aviation Club de France, and we hope to see you again in a few days for WPT Malta! Until then, goodnight from the PokerNews Live Reporting Team! Theo Jorgensen limped in from the button, Matt Salsberg raised to 435,000, and Jorgensen moved all in for 2,705,000. Salsberg snapped it off with , having Jorgensen's crushed. The board ran out , and it was all over. Jorgensen, who played fantastic at the final table, falls just short of becoming the first player to ever win the same WPT event twice, and will have to settle for the second-place prize of €264,600. Theo Jorgensen limped in, Matt Salsberg checked, and the flop came . Salsberg check-called a 250,000-chip bet from Jorgensen, and the turn brought the . Salsberg led out, and Jorgensen immediately folded. Theo Jorgensen opened to 250,000 on the button, Matt Salsberg moved all in, and Jorgensen snapped him off. The flop gave Salsberg a flush draw, and the turn was both four-sided and red, but the didn't change anything. The spiked on the river however, and that changed everything. Salsberg shipped a massive double, rocketing his stack to 3,950,000 chips and giving him the chip lead. Despite doubling Matt Salsberg, Theo Jorgensen is back to chipping away. 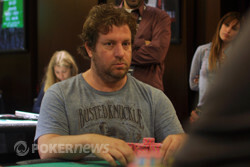 Theo Jorgensen moved all in with on the button, and Matt Salsberg quickly called with . It looked like the two players might chop the pot - that is until the flop came down . Salsberg had the lead, but the on the turn gave Jorgensen four more outs to win the title. The completed the board though, and Salsberg doubled. Matt Salsberg limped in on the button, Theo Jorgensen raised to over 500,000, and Salsberg mucked. Matt Salsberg moved all in over a raise from Theo Jorgensen with , and Jorgensen folded.